Screen icon James Dean will be getting the “Ultimate Collector’s” treatment on Nov. 5 when Warner Home Video releases the Blu-ray presentation of James Dean: Ultimate Collector's Edition. The three films included in the collection — East of Eden, Rebel Without a Cause and Giant — will also be released as separate Blu-ray DigiBook SKUs on the same date. The collection itself includes commentary tracks for all three films, plus three feature-length documentaries devoted to the mercurial film career of James Dean. These are: James Dean: Sense Memories (directed by Gail Levin, 2005), James Dean: Forever Young (directed by Michael J. Sheridan, with narration by Martin Sheen, 2005) and George Stevens: A Filmmaker's Journey (directed by George Stevens Jr., 1984). 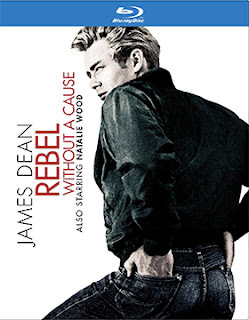 Other bonus goodies include a newly-prepared featurette titled “Dennis Hopper: Memories” and such vintage pieces as “East of Eden: Art in Search of Life,” “Rebel Without a Cause: Defiant Innocents,” plus recently discovered outtakes and screen tests for Rebel Without a Cause. Eagle Rock Entertainment promised a flurry of new Blu-ray releases this fall and judging from the Sept. 10 onslaught … they weren’t kidding. Four new Blu-ray presentations will be heading home on that date, led by the Blu-ray debut of UB40: Live at Montreux, 2002, plus such delights as Mike & the Mechanics: Live at Shepherds Bush, Neil Sedaka: Live at the Royal Albert Hall and Willy DeVille: Live in the Lowlands. Mike & the Mechanics: Live at Shepherds Bush is a 2004 reunion concert (following the death of Paul Young in 2000) recorded live at Shepherds Bush Empire in London. It is a 14-song set that includes “Silent Running” and “Falling,” plus there are seven music videos and interviews with Mike Rutherford and Paul Carrack. 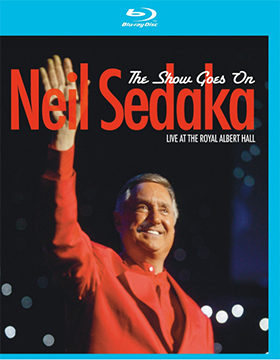 Previously available on DVD, the Blu-ray release of Neil Sedaka: Live at the Royal Albert Hall is an absolute stunner. When this rock icon set down to play at the packed Royal Albert Hall his fans were treated — delightfully so — to a two-and-a-half hour concert that featured an amazing 28-song selection. They are there — “Calendar Girl,” “I Go Ape,” “Laughter In The Rain” and so much more. Bonus features include an interview with Sedaka. Rounding out the Sept. 10 Blu-ray release package from Eagle Rock Entertainment is Willy DeVille: Live in the Lowlands. 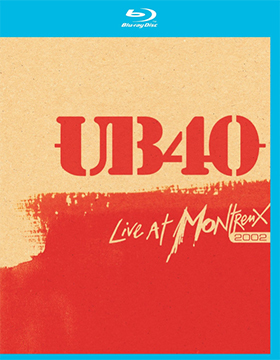 This live concert — recorded at the Paradiso in Amsterdam in 2005 — features 21 songs and a video interview Willy DeVille. Film Chest, in association with Topic Entertainment, announced this past week that a Sherlock Holmes’ dream collection has been assembled and digitally restored for delivery on Sept. 3 as a six-disc set that is simply titled, Sherlock Holmes: Digitally Restored! 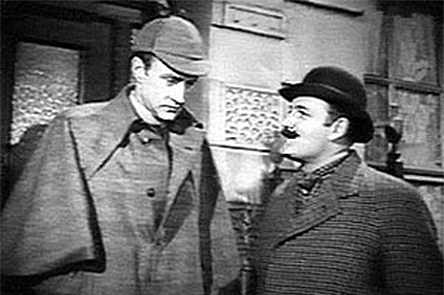 In addition to such feature film mainstays as director Roy William Neill’s 1942 presentation of Sherlock Holmes and the Secret Weapon (teaming Basil Rathbone with Nigel Bruce) and director Leslie S. Hiscott’s 1931 film, Sherlock Holmes’ Fatal Hour (with none other than Ian Fleming as Dr. Watson and Arthur Wontner as Holmes), five silent short films, three full-length television dramas (The Sting of Death, The Man Who Disappeared and The Adventures of the Speckled Band) and 20 episodes from the 1954 television series, Sherlock Holmes First Cases, starring Ronald Howard and Howard Marion Crawford as Holmes and Watson. Among the vintage silent presentations is the extremely rare 1900 Mutoscope short, Sherlock Holmes Baffled — the first appearance of Sir Arthur Conan Doyle’s famous sleuth. The other silent short treasures included in this unique collection are: The Copper Beeches (1912), The Dying Detective (1921), The Man With the Twisted Lip (1921) and The Devil’s Foot (1921). Well Go U.S.A. continues to be the source for most of the best films coming out of Asia these days, especially China. 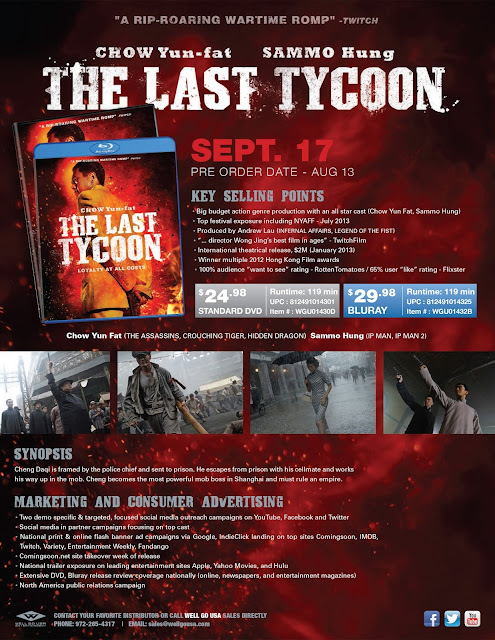 The latest of these of these cinema gems, director Wong Jing’s gangster saga, The Last Tycoon, will be available on Sept. 17 as both DVD and Blu-ray SKUs. Told in two distinct segments — circa 1913 and 1937 — we follow the career of future crime lord Cheng Da Qi (played by Huang Xiaoming and Chow Yun-Fat respectively), the story of which is loosely based on the actual life of Shanghai gangster Du Yuesheng. Basically, we get a look at his early life and the events that bring him to Shanghai. The film then skips ahead to the pivotal year of 1937, with Da Qi fully established as the head of the drug trade, in bed with the local secret police, however the Japanese Empire is ready to move on Shanghai and he must make some life-altering decisions. As if that wasn’t tense enough, overlaid onto this story is a life-long love affair and marriage — but not to the same woman. Events during the first part of story separated him from his true love, later he marries a beautiful woman of power, but finds as the Japanese menace draws near that the love of his youth is in Shanghai, but married to another man. The Last Tycoon is presented in Mandarin with English subtitles. 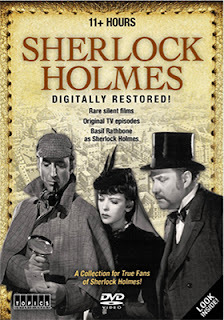 Bonus features include a making-of featurette. Well Go U.S.A. continues to mine the rich vein of Far East action thrillers with news this week that cult Hong Kong-based producer and director Johnnie To’s latest film, Drug War, will be making its domestic DVD and Blu-ray debut on Oct. 15. A limited domestic theatrical run (for critical appraisal) generated ticket sales of $25,539 and the ARR is a swift-to-market 81 days. Of note, this is To’s first “Mainland” production (in other words, outside of Hong Kong) and he has taken full advantage of the broad canvas offered him — I doubt if this film could be brought home for under $50 million in the United States. 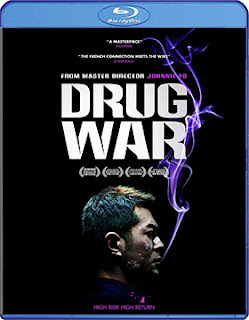 Drug War is absolutely gorgeous, with scene after scene effectively staged, with even the unexpected, the minor and the very unglamorous (where people hide drugs is not left to the imagination) holding our attention (think: the production values of a James Bond film to give you some sort of reference point). Add to this a tightly-wound script that has a drug dealer (a player) named Timmy Choi (Louis Koo — Protégé, Run Papa Run, etc.) being captured by a no-nonsense Tianjin police captain named Zhang (Sun Honglei — Mongol: The Rise of Genghis Khan, Lurk, A Woman, a Gun and a Noodle Shop, etc. ), who views him as nothing more than a key to unraveling a larger organization — when his services are no longer needed he will become expendable and Choi knows it. In a cat-and-mouse game, Choi has to give Zhang enough to stay alive … but the more he gives, the tighter the vise grows and the closer he comes to blowing his cover. A nifty crime thriller that is well-worth a look … presented in Mandarin with English subtitles. Stephen King has a certain knack for taking the normal and turning it into a place where the unreal becomes the new normal; a world turned upside down. 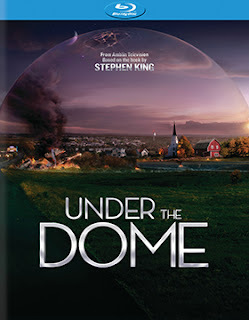 Under the Dome is his latest book-to-film creation, which started out as a mini-series but has now evolved into a full-blown network series (a second season is planned). 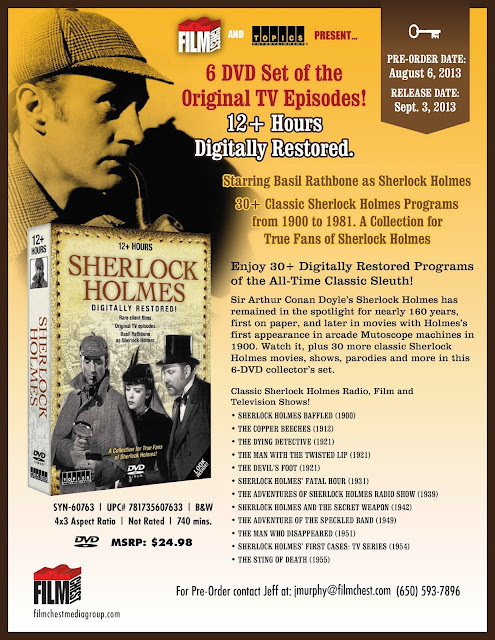 Paramount Home Media Distribution announced this past week that this CBS series will be heading home as separate four-disc DVD and Blu-ray product offerings on Nov. 5. Chester’s Mill, Maine is suddenly cut-off from the rest of the world by an invisible dome and those trapped inside soon find themselves caught-up in a life and death struggle as the strangeness of it all begins to take its toll. From battles over illicit drug manufacturing and petty power struggles to the discovery of the “Leatherheads” and revelations of more secrets than one can possibly keep count of, Under the Dome just zips along in 13 first season episodes (you have to just love Stephen King's new and wonderfully whacky alternate universe). Survival in this weird place may not be an option! Strange … strange … and stranger! Ah yes, Stephen King! 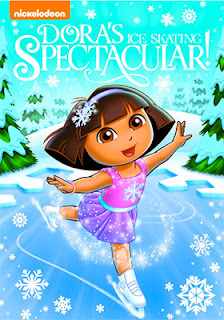 Also placed on the release calendar this week for delivery on Nov. 5 are DVD editions of I Love Lucy: Colorized For Kids of All Ages, which features three of her classic Christmas television specials for the first time in color — “Lucy Christmas Special,” “Lucy Goes to Scotland” and “Lucy's Italian Movie” — and the latest collection of Dora and Boots adventures, Dora the Explorer: Dora's Ice Skating Spectacular. The most extensive railway system in the world is in India. The roads connecting the major cities and trade centers are jammed with traffic — not a good option for commerce — and flying is for the wealthy, so what makes the most sense for India — again, in terms of commerce — is its vast network of rail lines. Almost 40,000 miles of track and nearly 7,000 stations make it all work. But there is more. 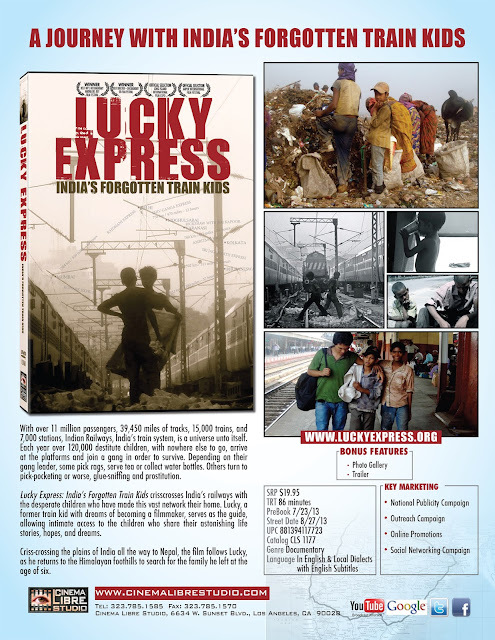 On Aug. 25 Cinema Libre will bring to the domestic DVD arena documentary filmmaker Anna Fischer riveting feature-length film on the tens of thousand of abandoned children who call the railways and stations of India their home. Titled Lucky Express, we get an a first-hand look at what it takes to survive from a former train station hustler named Lucky Bahadur. The film has been piling up film festival awards left and right, now with Cinema Libre’s DVD launch a much wider public audience is possible … this is one that is well worth a look-see. Mill Creek Entertainment’s attractively priced Kidvid DVD product offerings are at the vanguard of a 12-strong selection of newly announced titles this past week that will be available for consumers to own on Sept. 10. 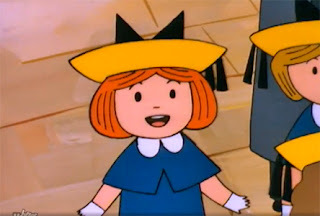 There are six Children’s selections on DVD included in the mix (all priced at just $9.98 each before retailer discounts) — three of these feature the adorable Madeline character created by writer Ludwig Bemelmans in 1939 and enjoyed by generations of young girls in both books and animated adventures ever since. These are: Madeline: Bonjour Madeline - The Original Specials (six animated stories are included here: Madeline, Madeline's Christmas, Madeline's Rescue, Madeline and the Bad Hat, Madeline and the Gypsies and Madeline in London); Madeline: Adventures in Paris (six additional animated stories: Madeline and the Marionettes, Madeline and the Ice Skates, Madeline and the Can Can Cliques, Madeline and the Fashion Show, Madeline at the Eiffel Tower and Madeline and the Perfume Factory) and Madeline's Merry Musical Melodies, featuring a collection of the best musical interludes from the Madeline animated series. Joining the six previously announced 12-film DVD collections (SRP is just $9.98 each) that are headed to market on Aug. 20 are two new three-disc, 12-film DVD sets in this Sept. 10 product mix. Top of the Class has “teen-themed” feature films that range from a young Matt Dillon starring in Liar’s Moon, Alicia Silverstone in Rock My World and the classic 1970s romp, Cheerleader Beach Party. See page 10 for a complete listing. The other 12-film, three-disc DVD collection is titled Under Fire and sports war-themed action films that range from Casablanca Express and Saigon: Year of the Cat to Tuareg: The Desert Warrior and Straight Into Darkness (also see page 10 for a complete title listing). Rounding out the DVD selections are 12-disc collection of the Steve McQueen Western television series, Wanted: Dead or Alive: The Complete Series (all 94 episodes) and the four-disc fitness collection titled Dance Fit Extreme: 4 Fat-Blasting Workouts. On the Blu-ray release front for Sept. 10, Mill Creek Entertainment has two new additions to its popular National Parks Exploration Series — National Parks Exploration Series Presents: Acadia - The First National Park of the Mississippi and National Parks Exploration Series Presents: Death Valley - Thriving Land of Extremes. For more information on these Sept. 10 product selection please visit the Mill Creek Entertainment’s website at: http://www.millcreekent.com. Much has been written this summer about the big “Hollywood” film flops. Although with studio accounting it is sometimes difficult to tell what is profitable and what isn’t … certainly Disney’s The Lone Ranger was a financial mess; everyone can agree on that one. 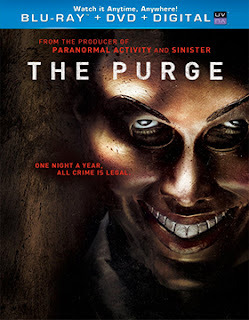 Another film that everyone nods in agreement on is the profitability of writer/director James DeMonaco’s The Purge … the highly publicized budget of around $3 million makes this $64.4 million box office success very profitable for Universal Pictures. Add in critical praise and genre-fan acceptance and you can take it to the bank that the home entertainment market will be another success story! This wholly original sci-fi thriller will be heading home on Oct. 8 as both a stand-alone DVD SKU and a Blu-ray/DVD Combo Pack (both include UltraViolet). The ARR for that street date works out to 123 days. In other release news this week from Universal Studios, look for the double-disc, four-film Blu-ray collection titled Tremors Attack Pack (included are: Tremors, Tremors 2: Aftershocks, Tremors 3: Back to Perfection and Tremors 4: The Legend Begins) on Sept. 17. Literally speaking, the monsters are among us. It is simply that time of the year! The monsters that we are speaking of are of the cinematic kind as the “Hollywood” studios having been taking turns of late in selecting street dates for their summer blockbusters — post Labor Day street dates are the most lucrative. 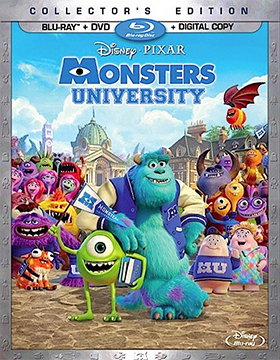 So it is with Walt Disney Studios Home Entertainment’s announcement this past week that director Dan Scanlon’s animated smash, Monsters University (a prequel, if you well) will be settling in on Oct. 29 as a four-SKU product offering. The ARR is 130 days and the box office haul was an eye-popping $258.6 million. Planned for consumer buying options are a stand-along DVD release, plus three Blu-ray/DVD Combo Pack SKUs — one includes a 3D viewing option, while the other two are either with or without a Digital Copy bonus (premium for that is five bucks). 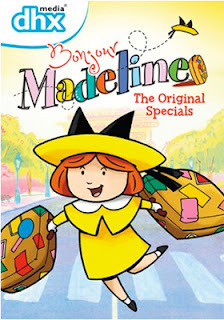 Bonus features for the Blu-ray product offerings include the short animated film, “The Blue Umbrella,” deleted scenes, unspecified audio commentary (we think writer/director Dan Scanlon — no word on Billy Crystal or John Goodman) and nine featurettes. 20th Century-Fox Home Entertainment has tabbed Oct. 15 for DVD and Blu-ray editions of actor-turned-director Paul Feig’s follow-up to his 2011 comedy smash film release of Bridesmaids with this summer’s hit, The Heat. There are three things in common with both Bridesmaids and The Heat — besides being incredibly funny. These are: Paul Feig, Melissa McCarthy and box office grosses of nine figures … The Heat has generated ticket sales of $149.5 million (more to come), while Bridesmaids pulled in an equally impressive take of $169.1 million. 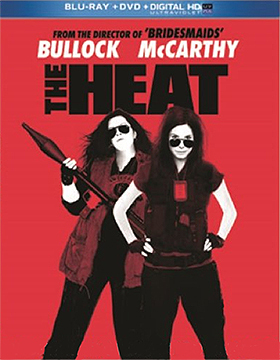 Throw in comedy veteran (and movie producer in her own right) Sandra Bullock as McCarthy’s acting partner and you have all the makings of a potential film franchise for the studio (The Heat 2 is rumored). For the record, the ARR for The Heat is 109 days. Also on the release calendar this week from 20th Century-Fox Home Entertainment are Blu-ray editions of Fantastic Voyage and Voyage to the Bottom of the Sea … street date is Oct. 8. The 1961 Irwin Allen sci-fi thriller sports commentary from author Tim Colliver (“Seaview: The Making of Voyage to the Bottom of the Sea”), the featurette titled “Science Fiction: Fantasy to Reality” and an interview with the film’s co-star, Barbara Eden. Additonal Blu-ray product offerings added this week included four single-disc double features on Sept. 10 (under the “Own the Moments” promotional banner) … these are: From Hell and The Order; Jennifer's Body paired with Buffy the Vampire Slayer; Mirrors plus Shutter and Wrong Turn teams up with The Hills Have Eyes.